Also see below for references to scholarship explaining QuikScan and investigating the future of texts in the era of information overload. There are also references to studies with visually impaired readers. These studies were conducted using Classic QuikScan, but the benefits should apply as well to QuikScan Views. This article, published in a prestigious journal, presents a rigorous experimental study demonstrating that QuikScan results in a 41% increase in text recall. This article reports on another successful QuikScan study that employed a different measure of text recall and tested an Indonesian (Bahasa language) text that is more complex than previously tested QuikScan texts. The article also discusses QuikScan as a possible response to readers' increasing unwillingness to read longer texts. Lohuis, A. (2013). QuikScan and reading strategies. Master's Thesis, University of Twente. Lohuis demonstrated, using gaze-tracking, that readers of QuikScan texts readily devise individual reading strategies to meet their needs. For example, some readers read the summaries and body text in a linear fashion (no jumping around), while others chose to return to the summaries after reading a section of the text, while others switched back and forth between the summaries and body text as they read each new section of the text. Zhou, Q. & D. K. Farkas, (2009). QuikScan: Facilitating reading and information navigation through innovative document formatting. Proceedings of the IEEE International Professional Communication Conference (IPCC). This proceedings paper reports on a study (part of Quan Zhou's dissertation) demonstrating that QuikScan enhances navigation within texts. Zhou, Q. (2008). QuikScan: Facilitating document use through innovative formatting. Dissertation. University of Washington (Seattle, Washington, USA). This is Quan Zhou's dissertation on QuikScan. It includes two empirical studies and a broad literature review. Weiss, Laura A. (2012). Improving texts with multiple summaries by aiding readers to build a text model. Masters thesis. University of Twente, The Netherlands. This thesis reports on a sophisticated study that establishes the means by which QuikScan improves text recall. QuikScan summaries improved text recall by enabling the reader to build a coherent text model of the main ideas in the text, rather than through simple repetition of these ideas. Schouten, Evy. (2014). The influence of QuikScan summaries on comprehension and recall of children in grades 5 and 6. Masters thesis. University of Twente, The Netherlands. This study did not show significant benefits of QuikScan with young readers. However, QuikScan was not explained to these students, and it appears that some of the students were not highly motivated to read the study texts. D.K. Farkas (2016). 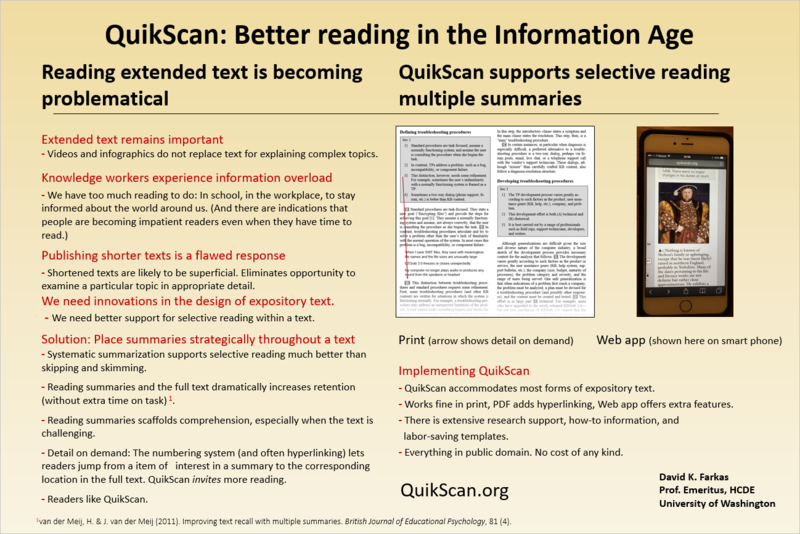 QuikScan: Designing for selective reading and better retention. Tech Comm Conference for Practitioners and Academics. October 14-15. Tacoma, Washington. This is a brief introduction to QuikScan in the form of an annotated slide deck—or an even shorter single-slide poster. Download the slide show to view the annotations. Zhou, Q. & D. K. Farkas, (2010). QuikScan: Formatting documents for better comprehension and navigation.Technical Communication, May 2010. This is the comprehensive design resource for QuikScan. It explains to write QuikScan summaries and how to adapt QuikScan to different kinds of headings and other variations in format. Farkas, D. K. (2012). Designing for selective reading with QuikScan Views. Proceedings, ACM SigDOC Conference. This article explains the design rationale, features, and benefits of QuikScan Views. Farkas, D. K (2015). Multiple summaries as an aid to reading literary texts. Presentation given at the 2015 IAIMTE Conference (International Association for the Improvement of Mother Tongue Education), June 3-5. Odense, Denmark (fully annotated pdf of slide deck). Proposes that QuikScan editions can prove valuable when students read literary works (both prose and poetry), especially as school assignments. Farkas, D.K. & C. A. Raleigh (2013). Designing documents for selective reading. Information Design Journal, 20 (1). DOI: 10.1075/idj.20.1.01far. pp. 2-15. This article briefly discusses readers' resistance to extended texts and then demonstrates that there are three broad approaches to designing texts for selective reading. QuikScan is an instance of the summarization approach. Zhou, Q. & D. K. Farkas, (2006). QuikScan: An innovative approach to support document use in meetings. Proceedings of the Society for Technical Communication (STC) Annual Conference. This is the earliest QuikScan publication. It discusses QuikScan as a means to support document use during business meetings. This was the main purpose for which QuikScan was originally intended. QuikScan, we believe, can indeed improve the effectiveness of business meetings in which a text is under discussion. Zhou, Q. (2008). “Blind reader and partial vision excerpts,” from QuikScan: Facilitating document use through innovative formatting. Dissertation. University of Washington (Seattle, Washington, USA). In a pilot test, a very capable blind reader and JAWS text-to-speech power user responds very favorably to QuikScan. Quan Zhou also shows how low-vision readers might use QuikScan with the NaturalReader screen-magnification application. Kasch, J. (2013). The use of QuikScan by blind and visually impaired readers. Bachelor's Thesis, University of Twente. Kasch reports rich qualitative data from a study of blind and low-vision students who read QuikScan excerpts of their textbooks and other study materials. All the research participants were very enthusiastic about QuikScan. The research was directed by Hans van der Meij and Thea van der Geest of the University of Twente. Kasch, J. (2014). The Influence of QuikScan (QS) on reading comprehension, recall, and information search by blind and visual impaired readers. Master’s Thesis, University of Twente. Kasch reports on empirical research in which QuikScan improved the high-level comprehension and retention of visually impaired readers. In unpublished follow-on research, QuikScan texts again resulted in better summarization (when students knew they were to write a summary), but did not yield significant results in a different measure of comprehension and retention.